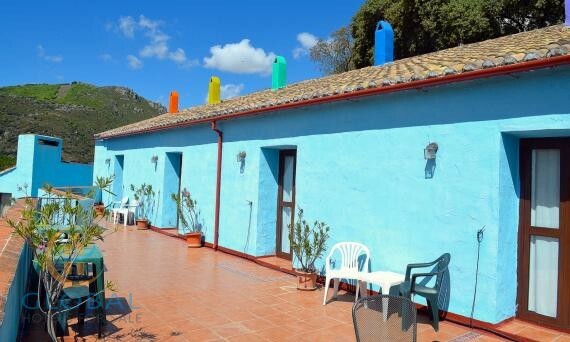 Update: reduced from 750.000 to 675.000 euro ! The unique 900m2 300 year old Cortijo is set in 20,000m2 of pine, almond and olive trees. The property has been renovated throughout by the current owners to high standard and offers 5 luxury suites, lounge, dining room and library. The owners have a 2 bedroom and 2 bathroom living area adjacent with a large kitchen. The guest accommodation comprises of a large lounge, dining room, library, storeroom, 5 luxury bedroom suites with en-suite bathrooms and separate toilet. WiFi is available throughout the hotel. The swimming pool (14m x 5m) was completely re-tiled in 2017 and converted to a non chlorine pool. This has been greatly appreciated by guests, especially those with children. This area is separated from the other areas of the garden by gates for security. The surrounding terrace is spacious and is complimented by sunbeds, tables and chairs. 4 garden areas laid with small stones, olive, almond, pine and fruit (cherry, plum, apple, peach) trees and a kitchen garden. Outdoor kitchen and WC, Chimenea for wood burning BBQ and sink, Pool pump house. Large Storage out-house. Wood store. Utility room housing water tank, boiler, oil tank and solar tanks, washing machine & tumble dryer. Large car parking area in front of the property.